I don't go to a pond to photograph Coots. I am usually hoping for something more colorful or exciting like an Osprey catching a trout. Coots become very tame though and since they always seem to be in range, when they do something a little different, I can't resist taking their photos. This coot has scavenged a dead trout from the pond and is taking it some distance from other coots to eat it at his leisure. 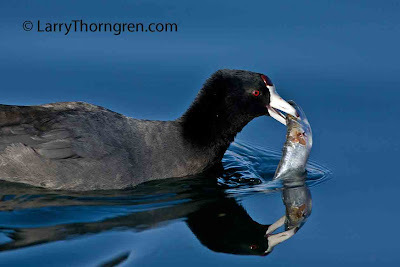 In watching coots every day for a couple of weeks, I have learned a lot about their eating habits. They eat just about anything. They come out of the pond and eat grass, they eat bread when people feed the ducks, and they are very fond of duck poop. They eat moss and with this photo, you can see they eat dead fish. They are real omnivores. This fish holding Coot looks nice..I think its quite difficult to take like this picture.Its really surprising for me that they eat grass and bread..Thanks for such giving such new information.